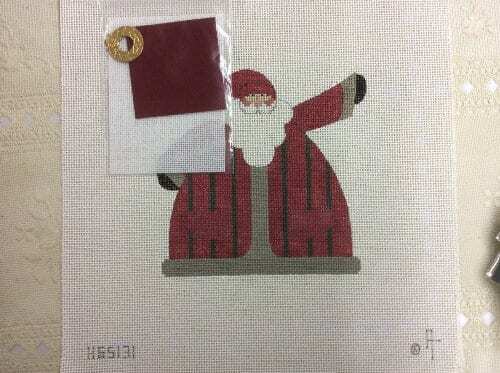 A hand painted canvas from The Artist’s Collection’s Heartstrings Pat Thode design that comes with a stitch guide suggesting threads and stitches that could be used on this rotund Santa with an out-stretched arm. His coat is red with green vertical stripes to make him look slimmer. It comes with a smaller canvas piece, red fabric and brass wreath charm to complete what he holds in his hand.